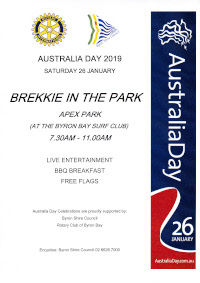 Usually on Australia Day (26th of January) Byron Bay Rotary organises a bbq breakfast with sausage sizzle in the Apex Park next to the Main Beach of Byron Bay. A Disc Jockey or Musicain cares for the right mood during our barbecue at the Apex Park. The BBQ starts at 7:30 am and finishes at 11:00 am. One member represents our Club at the Australia Day PRG Meetings of the Byron Shire Council. The attendees of the meeting prepare the event and one member of Rotary is often invited to the Byron Shire Council Ceremony. This Year 2019 the Australia Day Community Awards Event is at the Cavanbah Centre, Byron Bay at 5:30 pm on Friday, 25th January. Awards for the new Australian Citizens are still on 26th January. The Australia Day ambassador 2019 of the Byron Shire is Joel Pilgrim. Joel Pilgrim is the founder and CEO of Waves of Wellness. You can read more about him on his Website: https://www.foundationwow.org/. The Byron Shire supports our Rotary Club in his endavours to celebrate Australia Day. Just start your Australia Day with a snack at the Apex Park next to the beach of Byron Bay!!! The HELIDROP Event is a major fundraiser supporting Byron Rotary local Youth and Community Projects. This year Byron Rotary will be partnering with The Rescue Helicopter and supporting their operations of keeping the Helicopter in the air. The Event is going to take place on July 8th, 2018 at the Byron Bay Golf Club, 62 Broken Head Road, Byron Bay NSW 2481. The mixed Ambrose Golf Event will tee off at 10am for 140 players in 35 teams – open to all people far and wide but bookings must be made prior to the day with the Golf Pro, Greg (be quick) phone 02 66856470. The Golf Ball Drop takes place at 4pm on the 9th Fairway, with a Jet Ranger Helicopter dropping 750 numbered Golf Balls and the closest to the flag wins: 1st $4,000; 2nd $500; 3rd $100 ($20 tickets) and with the $10 tickets, 1st $2,000; 2nd $250; 3rd $50. On the day there will be raffles with great prizes, a sausage sizzle, putting competition for the kids, music/band and Peppi’s Pizza. 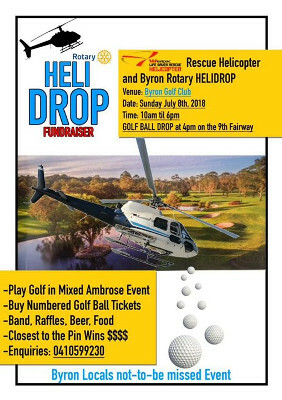 Tickets for the HeliDrop can be bought at the Golf Pro Shop, Byron Rotary, Farmers Market, the Beach Hotel or online !! You can purchase Online Tickets until THURSDAY 05th July 2018. This is an opportunity for you to involve the girls in your world – friends, workmates, community groups, schools etc. We are looking for 4 spool over lockers and clean cotton fabric for kit bags. We are hoping to get the word out to our local community for donations of overlockers and thread, appropriate fabric, washers, girls underpants , travel size soaps (see lists below). Days For Girls (DFG) is a non-profit organisation that helps girls stay in school and retain dignity, giving back important days of their lives. Most girls in developing countries miss school during their periods; many eventually drop out. Often women lose income because they are unable to work. We can do something about that by empowering girls, women and communities with access to sustainable feminine hygiene and sanitation and health training. 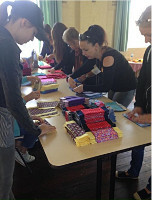 In partnership with Rotary Byron Bay and the Mt Warning Chapter of DFG Australia, us Eastgate girls can help resource and make lovely, high quality, sustainable feminine hygiene kits. Our Field Worker in West African, working closely with the village school and clinic, community development project, has already seen the value of these kits first hand. 50 kits were distributed last year and another 50 kits have been distributed so far this year. The project requires another 300 kits. We have the opportunity to make this a reality. This Project is based in Namuga, which is on the East side of Makira-Ulawa Province in Solomon Islands. This Province has a population of 50,000. What is it?–It involves upgrading the existing Area Health Care Centre to a Mini Hospital. It is a joint project with the Provincial Government, the local people and Rotary Australia. Once completed, this hospital will be run by the National Ministry of Health and will service the eastern half of the province; while the existing hospital will service the western half of the province. 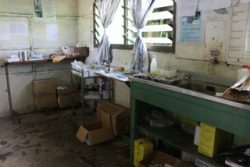 Why?—The current Area Health Centre in Namuga has two registered nurses and services are limited. If blood tests, x-rays, pharmaceuticals or a doctor are required, locals have no option but to travel to the province’s hospital in the capital, Kirakira. As there are no roads, the only form of transport to Kirakira is via canoe or power boat. Rough seas often prohibit canoe travel, especially for the sick. It is a 3-4.5 hour trip via powerboat to Kirakira, and the fuel can cost several months wages. What is in the new hospital?–The building structure of the Main Hospital and the auxiliary wing has been completed. It consists of female and male general wards, maternity ward, outpatient and emergency clinic as well as, operating theatre. The auxiliary wing consists of pharmacy, radiology department, dental clinic, diagnostic lab, medical incinerator. The solar panels installed run the whole hospital except for the operating theatre and dental clinic. The plumbing for the main hospital has been completed. Current Status–Building materials and equipment are on site for the fit out and are due to start when the provincial government has access to further funding for labour wages. We thank Dr. Chris Miller, project manager, Jack Visnner, building advisor for their tireless work through the years, as well as the volunteer teams who have spent there this year. Rotary Byron Bay has accepted the Job of Parking Supervision at the Local Farmer Markets in conjuction with the Local Fire Brigade. We attend to the Gates and Parking Area on 1st and 3rd Thursday of the month. For our Supervision of the traffic Flow we are allowed to rattle the bucket for donations. Rotary has undertaken that 100% of the funds collected from this source is directed to the nominated cause. Over the three years we have been doing this service that have gone to local charities and also help to fund our commitment to Bravehearts. In addition to Bravehearts, we have assisted, several local anti violence and child protection projects, SHIFT. Funds have also been collected to assist against various Natural Disasters like the Vanuatu Cyclone, Nepal and New Zealand earthquakes. Currently we are collecting to assist people affected by the recent floods and cyclone in North Queensland and closer to home like Lismore and Murwillumbah. For three days in May Byron Bay Rotary annually funds the Bravehearts team to Byron Shires schools and Pre-Schools delivering the experience of their highly successful interactive, live personal safety program called Ditto’s Keep Safe Adventure. A program teaching personal safety, understandig the issue and reinforcing the critical message and educating your children with skills and knowledge on how to keep safe. The show is a non-confronting and engaging way to teach children peronal safety and encourages children to speak out about unsafe situation such as child sexual assault, bullying, or domestic violence at home. The 30-minute interactive show is presented by trained facilliators who guides the children through a power-point-presentation and songs complete with actions, along with Ditto (the lion club mascot), who encourages audience participation. The main criteria includes; Yes and No feelings, warning signs, private parts, Secrets and Who to Tell. By empowering children the skills, language and knowledge to keep safe, it will help them speak out when they are feeling unsafe. It is only through increasing general awareness, increasing skills and capacity building for those working and living with children, preventative strategies, education and strong policies and legislation that we can accomplish Our Mission-stop child sexual assault in society. Bravehearts specialist services are instrumental in preventing the sexual assault of Australian children and giving hope and healing to the most vulnerable and precious of our community- Byron Bay Rotary started with a few schools eight years ago, now we are up to 9 primary schools and 5 preschools and introduced two Ballina Rotary Clubs to Bravehearts and they are funding five primary schools as of 2016. The Bay Barrier village of about 400 people is located on the extremely remote south-east coast of Pentecost Island in Vanuatu. 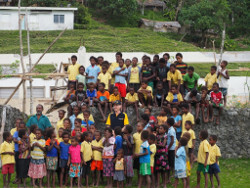 After the damage caused by Cyclone Pam in March 2015, the Byron Bay Rotary Club has been engaged in a project funded by Rotary Australia World Community Service (RAWCS) to rebuild the primary school classrooms destroyed by the cyclone. A local village action team of carpenters and a support team in the capital Port Vila have been working with Byron Bay Rotary representatives to purchase and ship building materials and tools to the village. Regular visits by our club representative during the project have sought to support the community so they can take responsibility for the works themselves. The repairs have been carried out in accordance with both national and Australian building standards and were completed by the building team in December 2016. The school now awaits a final visit by our club representative to make the final inspection and receive the certification report. When the Byron Bay Bunnings opened in February 2015, Byron Bay Rotary Club was invited to join them on a Saturday morning tradition of running sausage sizzle 3-4 times during the year. Byron Bay Rotary Club has been a firm favourite with the Bunnings staff and general public due to our preference in only selling great quality locally produced Wholly Smoked Sausages, which are often complimented on and keep them coming back for more. Byron Bay Highschool-Grants for underprivilieged students & DUX scholarships. Vanuatu -New roof to the Bay Barrier school building following a cyclone. Founded in Byron Bay, The SHIFT Project Byron is a short-term educational transition program for women who are homeless or at risk of homelessness. Established as a not-for-profit charity in 2015, the project is an incorporated association which is privately funded through individual and community support. SHIFT is governed by a strategically selected and highly skilled volunteer board of directors, who all share motivation to make a positive difference in people lives. The key objective of The SHIFT Project is to provide a supportive and stable enviroment where program participants can make their own psersonal SHIFT from disadvantage to empowerment. The program can accommodate five live-in positions. We also provide an outreach component that supports potential participants who live independently but are in need of assistance, as well as past graduates to access the education program. The projects aims to provide a sustainable education program, which is built around the organisation’s founding philosophy to develop wellbeing, inderdependence and reciprocation. It is informed by current research in the areas of interpersonal neurobilogy, somatic psychotherapy and the field of resilience.